CHICAGO – In the latest HollywoodChicago.com Hookup: Film, we have 10 pairs of guaranteed, two-night-only concert film tickets up for grabs for “One Direction: Where We Are”! HollywoodChicago.com, Fathom Events, Arts Alliance and Columbia Music invite you to experience global pop superstars One Direction on the big screen when “One Direction: Where We Are – The Concert Event” comes to cinemas nationwide in an epic music event. This rare, big-screen event will take place on Saturday, Oct. 11, 2014 and Sunday, Oct. 12, 2014 at 12:55 p.m. CST and 7 p.m. CST on both dates at 26 theatres throughout Chicago(land)! In your entry below, you MUST enter your FULL MAILING ADDRESS, FIRST and SECOND THEATRE LOCATION preference as well as your DATE/SHOWTIME preference! These are guaranteed tickets! Join Niall, Zayn, Liam, Harry and Louis on their sell-out world tour for the full One Direction concert experience. Recorded at the iconic San Siro stadium in Milan, this event offers the chance to experience the full concert captured live with all of One Direction’s biggest hits from “What Makes You Beautiful” to “Story of My Life”. Before the event, fans will also get the chance to go behind the scenes with a 15-minute, never-before-seen interview with the band cut with exclusive backstage tour footage. 10 pairs will be awarded to various Chicago(land) theatre locations below based on demand and availability. To win your “One Direction: Where We Are” passes courtesy of HollywoodChicago.com, just get interactive with our social media widget below. That’s it! The more social actions you complete, the more points you score and the higher yours odds of winning! Completing these social actions only increases your odds of winning; this doesn’t intensify your competition! Note: To win, you must enter your FULL MAILING ADDRESS, FIRST and SECOND THEATRE LOCATION preference and DATE/SHOWTIME preference below. 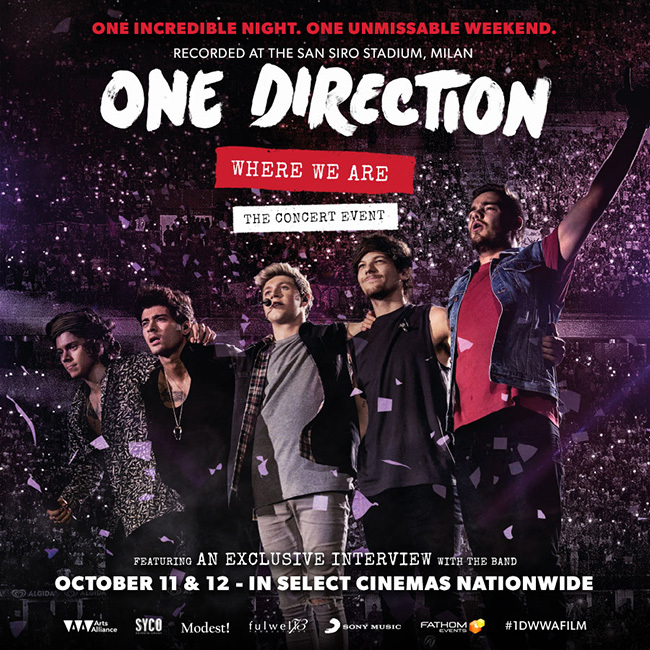 The event poster for “One Direction: Where We Are – The Concert Event” in nationwide theatres on Oct. 11 and 12, 2014. This HollywoodChicago.com Hookup is simple! Just get interactive in our social media widget above. We will award 10 pairs of event tickets based on social entry numbers and/or randomly via e-mail for our “One Direction: Where We Are” Hookup. Then winners will be snail mailed physical tickets before the event time. Good luck! Winners must arrive early. We recommend arriving at least 45 minutes before the showing’s scheduled start time. HollywoodChicago.com LLC is a promotional partner with the studio and its partners and does not assume any liability for this giveaway. HollywoodChicago.com is not responsible for errors or omissions entered in user submissions. Comments are closed in this Hookup.